The problem: Oftentimes with multi-movement classical pieces, each movement is a specific track, which iTunes treats as a “song”. If you want to shuffle through a playlist of classical music, you may get the 2nd movement of a Mozart violin sonata, followed by the 4th movement of Beethoven’s 9th Symphony, followed by a movement from a Shostakovich string quartet. What if we want to hear the full violin sonata, followed by the complete symphony, followed by the entire string quartet? And in the correct order? There are a couple of solutions to this problem. One solution is to use an audio editing program, such as Audacity, to combine the tracks into one single track, export it as a single mp3, then import that into iTunes. But what if you want to isolate a specific movement to a piece? You would have to scroll through the track to find it. Another solution, which I stumbled upon, works really well for me. In the “shuffle” setting on the iPod classic, you can select “songs”, “albums” or “none”. What I did was re-name all the albums in my iTunes so that each classical piece has a unique album name. Then when I select shuffle / albums in my classical music playlist, it will play the complete work. 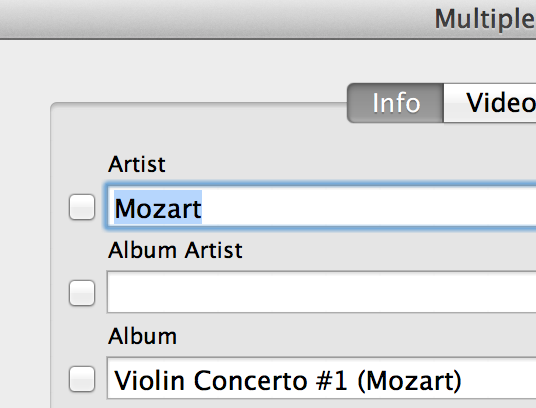 So for example, if I import a CD which contains 3 violin concertos, I would select all the tracks (highlight all the tracks the select “command / i, on a Mac). This opens up the info page where you can edit all the information of the selected tracks. I put the name of the album and the artist in the information box, in case I want to reference that later. For the “Artist”, I put the composer. (My apologies to the performing artists here, but as a composer myself, I am listening to the composition more than the performance.) Then I select the “Genre”. So the “Artist”, “Genre” and “Info” are all common to ALL the tracks on this album. and open the information box again. Now here, for “Album”, I type in the name of the piece, “Violin Concerto #1”. Here you want to come up with a way to distinguish it from other pieces that are called “Violin Concerto #1” by other composers, or perhaps you have multiple versions of this same Mozart concerto. In Mozart’s case, you could include the catalogue number for the piece in parenthesis. -Flat K. 207. I simple put (Mozart) in parenthesis after “Violin Concerto #1”. If I had a 2nd version with a different performer, I might do this “Violin Concerto #1 (Mozart / Heifitz). After this, I may go back to each individual track, highlight it, and open up the information box. Now all that is left is to type in the name of the track itself. In the Mozart violin concerto example, track 1 of the piece is called “Allegro Moderato”. When the name of the track is the tempo, personally I don’t care, so I just keep it simple. 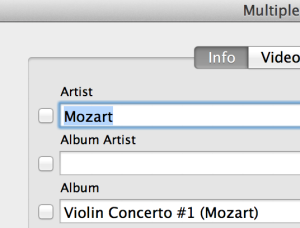 If I am online when I imported my CD, or if I bought it digitally, then iTunes may automatically import a track title. I may edit that to “Movement 1” or just leave it as is. If not online when importing the CD, you get “Track #x” for the song title. Basically, for my purposes, it doesn’t matter, so I just leave it like that sometimes. Now you may wonder how iTunes knows to play the movements of a piece in the correct order if it is in album or grouping shuffle mode. If you look back at the information box for a particular track, you will see that it shows the track number, 3 of 13 for example. When you import a CD, it will automatically assign this. If the first movement of the Mozart violin concerto is on track 4, the second movement will be track 5 and so on. So it will automatically play these back in order. If for some reason, your recordings ended up without track numbers, you can go back and assign them so that they play back in the correct order. Or if for some odd reason, you would rather hear a piece in the order not intended by the composer, you could edit those numbers and rearrange the order of movements to any piece. You may have some single movement works in your classical playlist, for example “La Mer” by Debussy, “The Water Goblin” by Dvorak, and “Overture in C” by Schubert, all came on the same album with the same title. In this case, I duplicate the name of the the track with the name of the album. If a name seems like it might be common to another piece by a different composer, I will put the composer’s name in parenthesis after the track in the “Album” field. If the “Album” field remains blank, this will be treated as a single album, so you may get that “album” selected in your shuffle, that is, all the tracks that do not have a unique album title. That’s why it is good to give single movement pieces a unique album name, if you want to mix them into your playlist. Now I also wanted to mention that with newer versions of iTunes, you can create “Groupings” and shuffle by groupings. 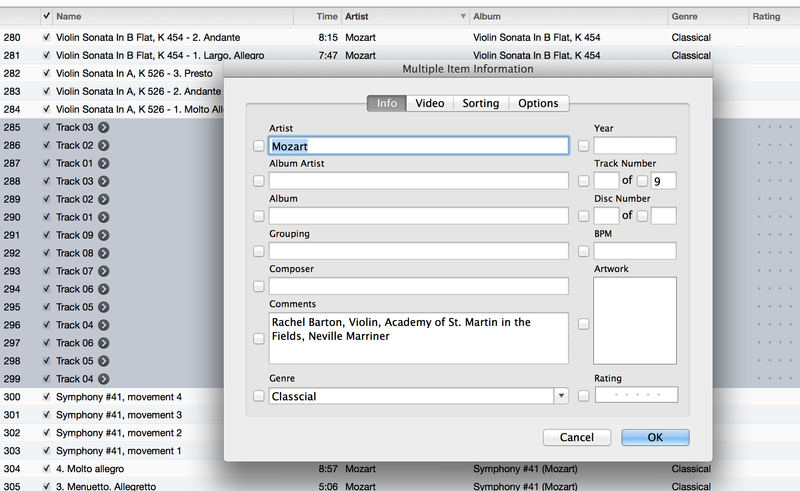 So each piece can be assigned a unique name in the grouping field, regardless of the album name. However, I usually do not use the iTunes on my laptop for playback. I usually use my classic iPod, and the only shuffle options available are “songs”, “albums” and “none”. I’m not sure about other Mac products which interface with iTunes, and if some will shuffle “groupings” or not. This is the best solution for listening to multiple movement classical music with iTunes. I hope it helps you out as well so that you can enjoy listening to classical music with iTunes. Please leave me a comment below!